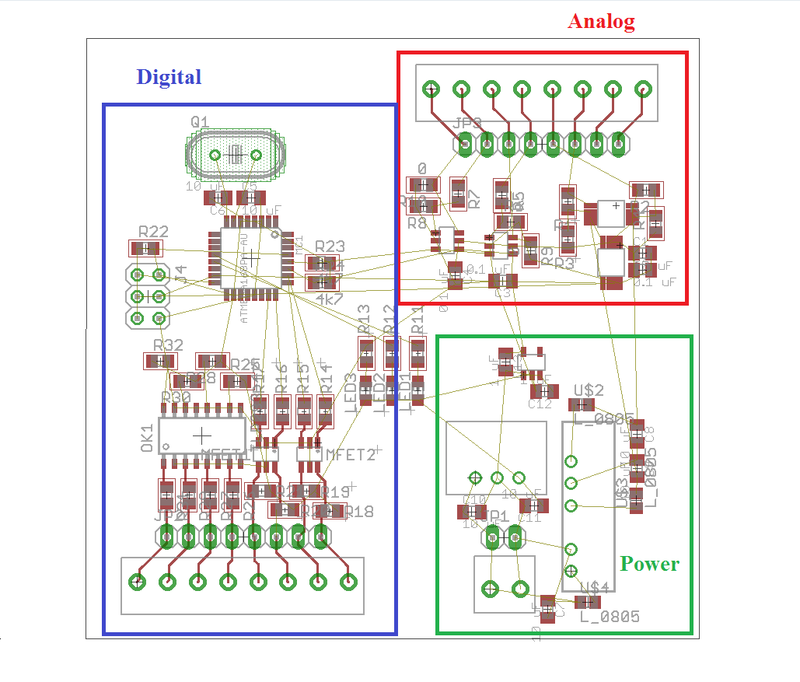 I'm currently designing a mixed-signal PCB for a client and I've been reading a lot about signal integrity and most of the books recommend a 4 layer board (or more) because of the noise resistance from having a solid ground plane and reduced routing. The board in question has two 16-bit ADCs and two 16-bit DACs with OP amps in the analog section, a microcontroller with some level shifters and mosfets in the digital section, and two DC/DC converters and an LDO regulator in the power section. Space is not much of a constraint, but having high resolution and low noise in the analog section is important. There's an I2C and an SPI bus running between the digital section and the edge of the analog section, operating at less than 10 MHz. Routing wise I can totally get this board done in 2 layers. Will I really notice a huge difference in signal integrity with a 4 layer board and dedicated ground plane? Is it worth the extra cost? I'm leaning towards 4 but I'd like to hear your opinions. first allow me to clearly state my answer. A four layer board will give better performance. The difference is not stark for all boards, but the four layer board will allow you to route signal, power, and ground, directly over each other in a larger variety of ways. Keeping ground directly under the power plane will reduce crosstalk for close proximity lines and reduce noise by allowing overall better routing choices. With four layers, single point ground is an achievable feat without also cutting the ground plane in two. Essentially, if the two layer solution requires cutting across the ground plane, then you are creating two ground planes connected by two points. This allows a current loop, causing noise, and this can be exacerbated by temperature differentials, nearby electronics, etc. I am not sure as to the use case of this device, but the temperature, nearby EMI, and operating frequencies will all play in. If this is a semi-high speed design, then a four layer will definitely save the integrity of those signal lines. A lot of this comes down to how much resolution you need from those ADCs. If you truly need 16 bits, then I would say a 5% performance increase from a four layer board is worth it. If you can do most of your routing on the top layer and have mostly solid ground plane sections on the bottom layer, I'd say that a two layer board should probably work for you. One of the truly awesome people I've met over the years - Dave Vanhorn - routinely does fast and high-density boards on two layer boards and his products all pass emissions compliance testing without any problems. But he is a true master of that art whereas many are not. Regardless, your board looks fairly simple. Break the bottom ground plane layer into sections for each circuit block: analog & digital and ensure that you know where the return currents are flowing. It's usually okay to have small breaks in the ground plane where you have to have one trace cross another. But those breaks are small and fully enclosed with copper, exposing only the short trace that goes under the top-side trace. It seems the regulator powering analog circuits is in the power section, you should move it to the analog section, so its GND reference pin sits on the analog GND. This way, its output is referenced to analog GND, not to noisy GND near the switchers. Now, for your 2 versus 4 layer question, using 4 layers will reduce the difficulty of making a very good layout, thus it will reduce the probability of making a mistake. If a mistake means a respin, then you should weigh the cost and delays of a possible respin versus the extra cost of 4 layers.